So I have a confession. I used to dread going to kids’ birthday parties. Don’t get me wrong – I love the socialising and seeing my boys have fun. But I’d also have a teeny sense of dread about how I’d navigate the ‘food situation’. Before you remove us from your party invitation list, hear me out. For years, we saw a direct impact of the food my four year old ate during the day, and how he slept at night time. His chronic gut issues and food intolerances meant an excess of sugary, processed, wheat based or additive filled foods would keep Isaac awake at night with tummy pain. So I’d arrive at each party in Helicopter Mum mode – armed with healthy substitutes and ready to distract my toddler from the brightly coloured foods that called for his attention. Thankfully, after several years on a gut healing protocol, he is now able to handle the odd bit of ‘junk’ without huge consequences at night time. So parties are now much more enjoyable and Helicopter Mum has retired. BUT I still can’t help but wish that there were fewer Red Frogs, and more wholefood options at kids’ parties. 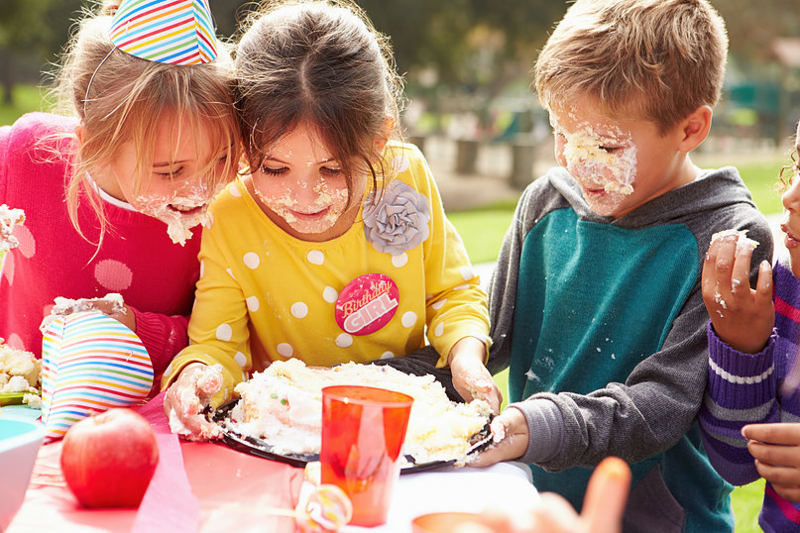 Yes, Fairy Bread is an ‘occasional treat’ or only ‘every now and then’ but the reality is that kid’s parties are actually more often than we think. There seems to be a constant reason to have these party foods – playdates, morning teas, special themed days, celebration days and sometimes just because ‘they deserve a treat’. But is it really a treat if it leaves the kids bouncing off the walls, having a meltdown or with a tummy ache at the end of the day? Now call me a party pooper but isn’t the fun of parties about playing with their friends and having a great time, rather than eating brightly coloured, processed foods? Now this doesn’t mean kids need to miss out. Here are 7 healthier, yummy wholefood options for kids party food that they will actually eat. And remember – keep it simple! Fruit, fruit, fruit. Nature gave us the most colourful, sweet treats in the perfect package – fruit! Try fruit cups, fruit kebabs or fruit platters. Meatballs – try this delicious, easy recipe – I’ve substituted the breadcrumbs for buckwheat flour and it turns out well. Stew in a plain passata sauce or serve with tomato sauce for extra taste. Sushi or rice paper rolls – find a local fresh caterer for a simple, stress free option that everyone loves! Popcorn – it takes 3 minutes to make your own. Keep it simple with real butter or coconut oil and sea salt. Or add Vital Veggie Power available here for a tasty, nutritious seasoning. Steer clear of microwaved popcorn as it is usually filled with trans fats and additives. Chocolate bliss balls or slice – you’ll find my favourite nut free bliss ball recipes here. No time to roll balls? Just pour the mix into a lined tray, smooth and flatten out and pop in the fridge. Once it’s cool and firm, slice into squares! Cheesy zucchini slice – here’s my favourite, easy party friendly zucchini slice recipe – works well with gluten free flours. Vegetables! Yes, vegetables. Crunchy capsicum, sweet cherry tomatoes, crispy carrot sticks or fresh baby cucumbers. Serve them with a yummy dip and you’d be surprised how many kids will eat them when you pop it on their plate. And if not, the adults will certainly appreciate them. (Of course, be sure to slice the cherry tomatoes for younger children). Choc banana ice-creams or banana split! Cut a frozen banana in half, insert a popstick and roll in melted chocolate. Sprinkle with shredded coconut. Or slice a banana down the middle and drizzle with Loving Earth’s Chocolate Coconut Spread and shredded coconut. So simple – and delish! Lolly bags – let’s face it. Kids don’t need more sugar after a party. So many parents I speak with either hide or bin the lolly bags after parties, or swap them for them for something else the kids like. When we are hosting kids parties, we include just one or two sweets (like a plain chocolate) along with other fun items such as toy cars, coloured pencils or bubbles. No complaints from the kids, and keeps the mums happy too! So there you have it – 10 healthier options for kid’s party foods. Which ones will you try? Do you have a favourite wholefood party food recipe?